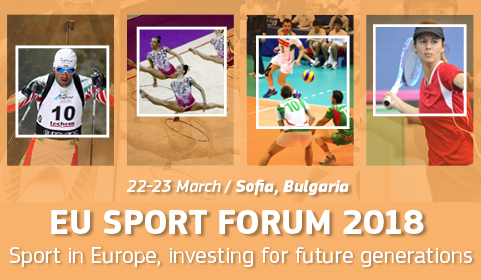 The 2018 edition of the EU Sport Forum will take place on 22-23 March, in Hotel Marinela, Sofia, on the occasion of the Bulgarian Presidency of the Council of the European Union. The Erasmus+ Sport Infoday 2018 will take place on the 30th of January 2018, in Brussels. Follow the event live via web streaming. DG Education, Youth, Sport and Culture of the European Commission organised the EU Sport Forum in St Julian’s, Malta, on 8 and 9 March 2017. The Infoday provided information potential applicants about Erasmus+ funding opportunities in 2017. The European Commission and the Education, Audiovisual and Culture Executive Agency (EACEA) hosted a Sport Info Day in Brussels to inform potential applicants about the new programme and its funding opportunities. On 11 June 2014, the European Commission organised a conference 'European Week of Sport – Preparing for the launch in 2015' which took place in Brussels at the initiative of Commissioner Vassiliou. It involved about 150 experts from governmental and non-governmental sport organisations and institutions from all over Europe.